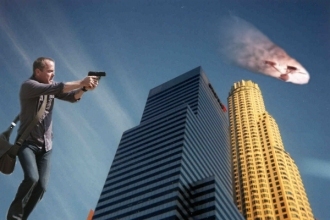 Following an episode of Fox's 24 that featured Jack Bauer shooting down a helicopter armed only with a hand gun, the show's producers faced criticism from fans and TV critics alike that this action was probably pushing the boundaries of plausibility of the popular action hero's capabilities. The shows producers released a statement saying that the fan's criticism of them was entirely unjustified. They explained that if they thought they knew what Jack Bauer was capable of from just watching the first 4 and a half seasons they were wrong, what he had done in the past was only a fraction of what they were going to see in the next 14, most explosive, most exciting, most fast paced, most shocking, most critical, biggest, most explosive and most explosive episodes of 24 ever broadcast. Keith Wilson then went on to show us the latest production still to be released to the public � clearly showing Jack Bauer shooting down the Starship Enterprise. This comment contains an external link and will not be made viewable until unlocked by the administrator. I believe that Bauer can shoot down the Enterprise (the spaceship OR the USS Aircraft carrier) because I personally saw Chuck Norris karate chop the Eiffel tower (the original one). 24 takes a lot of crap from the media. I still applaud them for there intelligently designed plot, and there ways. Isn't it time you did nothing? A site with a lot of content - including News Satire at the New News.